Recently, I have been experimenting with some new photo techniques for shooting models finished in NMF or silver paint. I've never been happy with my results in the past and I think I still need to refine certain aspects of my current set-up. Nevertheless, some of my recent efforts using some new imaging and processing software turned out halfway presentable and I thought I'd share a few of the better shots. 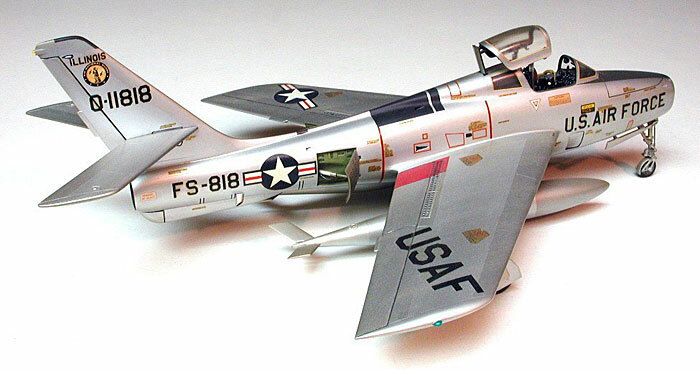 Most of these models are several years old (hell, decades!) as can be plainly seen by the "brown out" visible on several decals and the slight yellowing of the white-painted details. 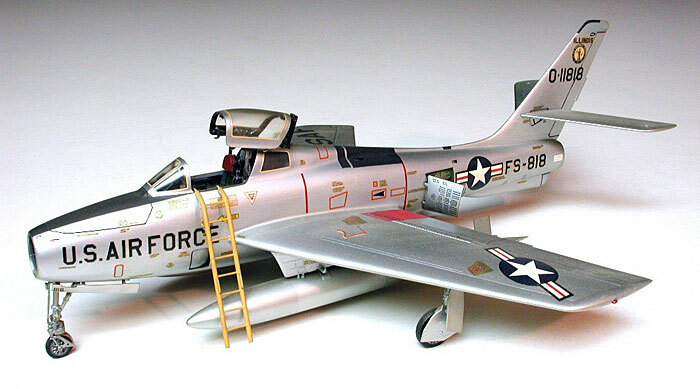 This 1/48 scale Monogram F-84F Thunderstreak was a quickie as well, with only a modest amount of extra detailing where it was appropriate. I miscalculated on the amount of ballast required to keep the nose down so I was forced to add additional weight forward in the form of a boarding ladder, scratch-built from aluminum tubing and steel wire. The decals are spares box orphans with the scheme representing an Illinois Air National Guard aircraft mobilized for federal service during the Berlin crisis of 1961.